Polar vortex. Arctic blast. Deep freeze. STAY INSIDE! ...All phrases and terms I've heard repeated countless times on the news and weather channel. Apparently, it's also colder throughout the Midwest than at the South Pole. Keep in mind, it is also summer in Antarctica. Yes, that's a fence behind the snow pile...you can imagine how this much snow would make farming more difficult. Many schools and businesses have closed due to the extreme cold. People are also urged to stay home and not travel on the roads. Not everyone CAN stay home, though. Emergency personnel have a job to do and so do snow plows. Growing up, we always looked forward to the one or two snow days each year. However, while this was fun as a little kid, farmers do not get snow days. So, along with emergency personnel and snow plows, farmers also have a job to do. Many farmers live on the farm, but many also live nearby. This requires them to drive or otherwise travel to the farm. Usually, this is no big deal. Add 13 inches of drifting snow, ice and frigid temperatures and it's a bit more difficult (and cold). So why can't farmers take the day off? That's simple: livestock don't take a day off so farmers don't either. Think about it: just because the weather isn't perfect, you wouldn't think about saying, "Well, it's cold so I'm not going to feed my dog today." That just sounds mean. Same thing with cows. Cows NEED to be fed and milked. Cows also tend to eat more when it's cold. Keeping fresh water available is always important, but keeping those pipes thawed can be a challenge. 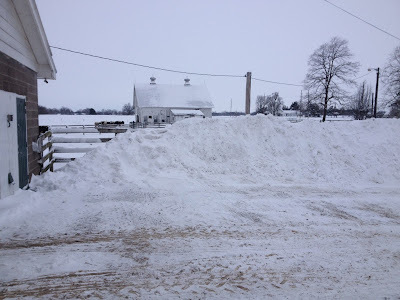 Farmers work a lot of extra hours to keep pipes thawed, driveways plowed (if milk trucks are running, they need to get in...there is a limit on how long milk can stay in the bulk tank on the farm), livestock fed and cows milked. I've heard some non-farming folks talk about "confinement" barns like they are a bad thing. The opposite is true. Just because cows are kept in a barn does not mean they are not cared for. Lots of people enjoy seeing cows out on pasture (myself included), but there are times when this is just not in the cows' best interest. Times like now. When it's cold (or hot), people tend to stay inside in temperature-controlled environments. Cows like that too. Fans and misters help keep barns and cows cool in the summer, and curtains on the side of barns and other means of closing up the barns keep cows warmer in the winter. Farmers ensure cows have adequate space to move around in the barns and also see that they have access to fresh feed and water. Parents bundle kids up in lots of coats and warm clothing when they are outside in the cold. Some farmers put calf coats on their calves. 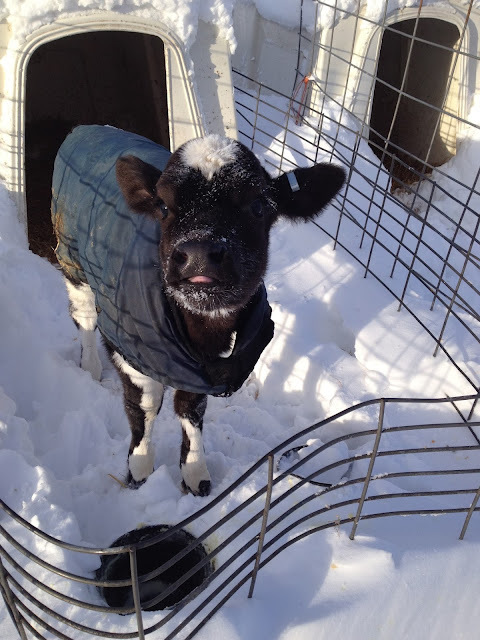 In college, we cut the sleeves off a coat and put it on a young calf to keep her warm as the temperatures dipped near 0. 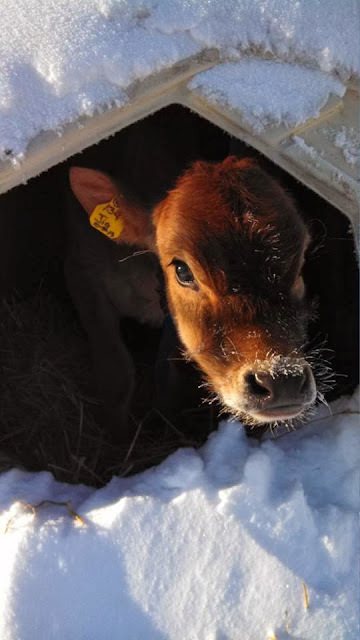 Cows, like adults, are better able to keep themselves warm (although they still need some help...which is why farmers put them in the barn to keep them warm), but calves usually need more help staying warm. Many farms, like Knollbrook Farms, stacked bales of straw in front of the openings to the calf hutches to keep some of the cold air out of the hutches and away from the calves. Other friends have used tractors and other farm machinery to pull people out of the snow. People that should not have been driving around in a blizzard in a small car. In some places, it is so cold that some equipment is not working. Now this is a huge problem. Extreme weather is no good on the farm, but unlike many other businesses, farms do not have the luxury of closing up shop for the day to enjoy a snow day or stay inside where it's warm. If that doesn't show we love our animals, I'm not sure what does. Many people stocked up on food prior to the storm and milk was flying off the shelves. After the storm is over, don't forget to continue picking up a gallon of milk during your trips to the grocery store. 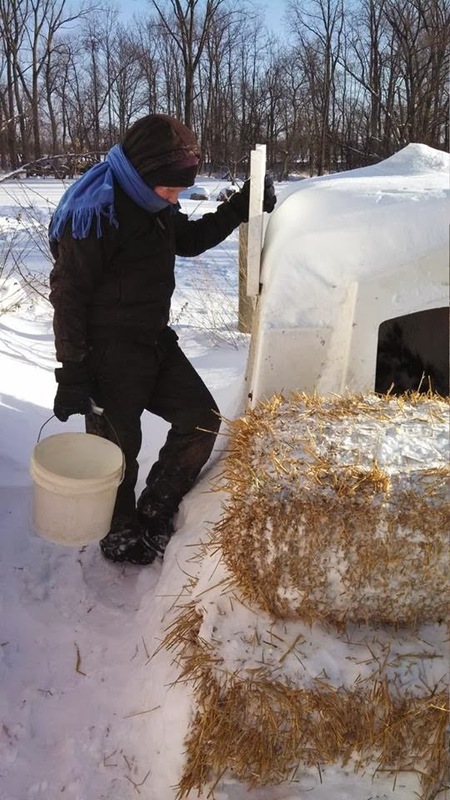 While many people don't think about what it takes to get that gallon of milk to your kitchen table (prior to your trip to the grocery store), keep in mind that while temperatures are dipping well below 0 and the blizzard is creating un-ideal conditions, farmers are still out caring for livestock to ensure you continue to have a steady supply of milk.